After installing the mod, you can take an ordinary bone, click by it on any mob, transform and get his abilities! This is really cool! At the same time you will also be able to choose for example, the view from the 3rd person to be sure. Thus, you can turn to ocelot, cow, or even a huge ghast and rise high into the sky. Watch this video, everything is shown! Ocelots Mod for Minecraft PE 0.11.1 / 0.11.0You can now find and tame ocelot installing this mod. Ocelots in Minecraft PE 0.11.XOne of the new developers MCPE - Daniel Wustenhoff shared gif picture, which shows the running ocelot around the torch! Most cool that it's a real ocelot as PC version! 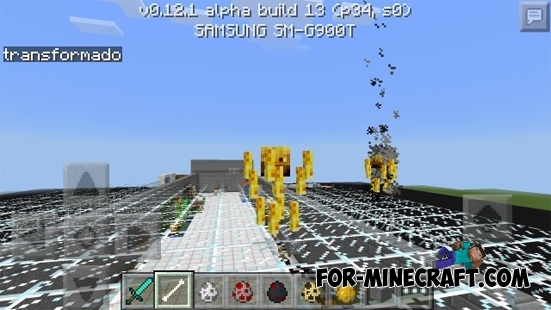 Ghast Spawn Egg mod for Minecraft Pocket Edition 0.11.1A simple but very useful mod that adds ghast spawn egg in Creative mode!